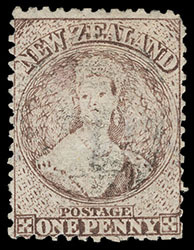 New Zealand, 1872, Queen Victoria "Chalon Head", 1d brown, perf 12½, N Z watermark, exceptionally well centered, bright color and very lightly cancelled, fresh and Extremely Fine gem; with 1959 R.P.S.L. and 2000 R.P.S.N.Z. certificates. Scott No. 45. Campbell Paterson No. A1s. SG No. 140 £9,000 ($11,830). ONE OF THE FINEST RECORDED EXAMPLES OF THE RARE 1872 1D BROWN PERF 12½ "N.Z." WATERMARK ISSUE. 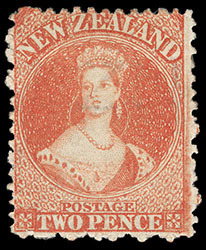 New Zealand, 1872, Queen Victoria "Chalon Head", 2d vermilion, perf 12½, N Z watermark, o.g., hinge remnants, deep vibrant color showing some plate damage at right, small gum crease, fresh and Very Fine. Scott No. 46. Campbell Paterson No. A2v. SG No. 141 £1,500 ($1,970). 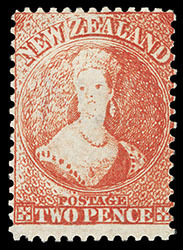 New Zealand, 1872, Queen Victoria "Chalon Head", 2d vermilion, perf 12½, misaligned horizontal perforations, N Z watermark, exceedingly well centered with strong brilliant color, neat face-free barred oval cancel, faint corner crease lower left, particularly fresh and Very Fine, an unusual production variety. Scott No. 46. Campbell Paterson No. A2v. SG No. 141 £350 ($460). 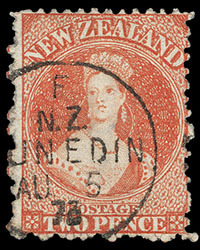 New Zealand, 1872, Queen Victoria "Chalon Head", 2d vermilion, perf 12½, N Z watermark, rich vibrant color, cancelled by "Dunedin AU 5 73" cds (the earliest recorded date), fresh and F.-V.F. Scott No. 46. Campbell Paterson No. A2v. 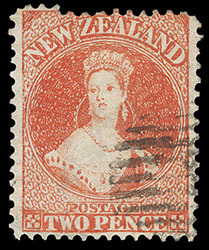 New Zealand, 1872, Queen Victoria "Chalon Head", 2d vermilion, perf 12½, N Z watermark, strip of three (R. 8/1-3), well centered with strong vibrant color, cancelled by "N 1" barred ovals and "Nelson, AU 13" cds, s.e. at left, Very Fine and choice strip, an exceedingly scarce used multiple, H. Gordon Kaye, Christie's Robson Lowe, April 1991, lot 703. Scott No. 46. Campbell Paterson No. A2v. SG No. 141 £1,050 as singles ($1,380). New Zealand, 1872, Queen Victoria "Chalon Head", 2d vermilion, retouched, perf 12½, N Z watermark, unused without gum, pos. R. 20/10, rich bright color, strong sharp impression clearly showing heavy retouching, light diagonal crease at bottom left, Very Fine appearance; with clear 2017 Odenweller certificate. Scott No. 46 var. Campbell Paterson No. A2v (Y). SG No. 141a £1,900 ($2,500).